Goldfarb, Magalhaes, and Baugh claim victory in Columbus! In a weekend packed with legendary creatures and historic spells,David Goldfarb, Edgar Magalhaes, and Jacob Baugh made history of their own in Dominaria Team Limited. THE HASHTAG FOR GRAND PRIX COLUMBUS IS #GPCOL. JOIN THE CONVERSATION. Team Limited was an incredible way to kick off Dominaria. 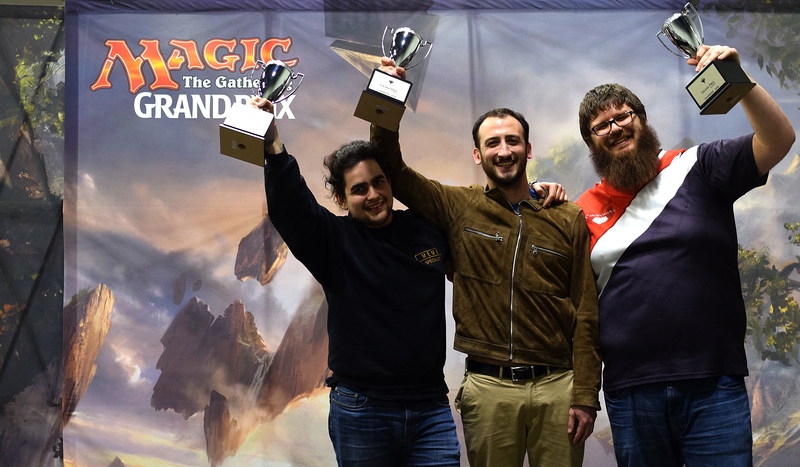 Over the course of one weekend and fourteen rounds of Sealed here in Columbus, players explored the new format and archetypes. It was an exciting weekend as teams jockeyed for position, angling for a spot in the Top 4, a chance to draft Dominaria, and a shot at the GP trophy. At the end of two Team Sealed deck builds and fourteen rounds of play, the teams moving on to the Top 4 were Kellen Pastore, Steve Noga, and Daniel Barkon, David Goldfarb, Edgar Magalhaes, and Jacob Baugh, Sam Black, Matt Severa, and Andrew Baeckstrom, and Jeremy Lavrenz, James Lavrenz, and Jake Lamb. The finals came down to Lavrenz, Lavrenz, and Lamb versus Goldfarb, Magalhaes, and Baugh, and another team draft. Magalhaes took the first match over James Lavrenz with his aggressive red-white deck, but then Lamb tied it up by defeating Baugh with a white-blue deck. It came down to Jeremy Lavrenz and his black-red deck headed up by Demonlord Belzenlok and Goldfarb and his blue-black deck with some powerful fliers and a lot of bounce. It was Goldfarb who took the match, securing a win for team Goldfarb, Magalhaes, and Baugh! Congratulations to the GP Columbus champions! Day has come to a close at the Greater Columbus Convention Center.Over 440 teams started Day 1, ready and eager to play the eight rounds ahead of them. At the end of those eight rounds, only a single team stood undefeated. Sam Kuprewicz, James Bush, and Ryan Rolen are midwestern players, Kuprewicz and Bush from Chicago and Rolen from Milwaukee, who have been testing, playing, and competing together for years. Today, the decks they built from their Sealed pool included a white-blue deck with all-star Karn’s Temporal Sundering, a four-color deck anchored in black-green but splashing Tatyova, Benthic Druid, and Arvad the Cursed, and a blue-red wizards deck whose all-star was the common Ghitu Chronicler. Tomorrow they, as well as all teams with a 6-2 record or better, will return to battle for a spot in the GP Columbus Top 4 and a chance at the set of team trophies.Congratulations to Kuprewicz, Bush, and Rolen, and to all players who helped map Dominaria on release weekend!